It looks like the end of an era at Real Madrid after last night’s humbling 4-1 home defeat to Ajax in the Champions League. 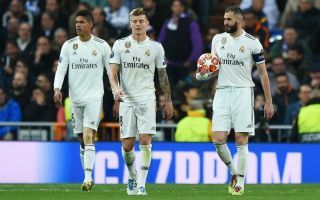 One imagines this Madrid squad that won three Champions League finals in a row so emphatically before the blow of exits from Zinedine Zidane and Cristiano Ronaldo last summer will now see further changes made. According to Don Balon, one name that already appears to be on the way out is striker Karim Benzema, who has supposedly reached a total agreement over a transfer to Paris Saint-Germain to replace Edinson Cavani. This makes sense as a next move for the Frenchman, who can return to Ligue 1 after a long and great career to look back on at the Bernabeu. Benzema still looks to have plenty to offer at the highest level, even if he’s not quite the player he was a few years ago. Against Ligue 1 defences, one imagines Benzema could do plenty of damage alongside world class attacking players like Neymar and Kylian Mbappe. The 31-year-old will surely go down a Real Madrid legend, but it makes sense that it now seems time for a change as the club look in need of a major rebuild.